Jungle Safari in Ranthambore National Park is a unique example of natural and historical prosperity. Enjoy Jeep and Canter Safari. Visit to Ranthambore Fort. In the first era, Ranthambore was known as the hunting place of the Jaipur Maharajas. But after the declaration of National Park in 1980, Ranthambore become one of India's leading tourist destinations. 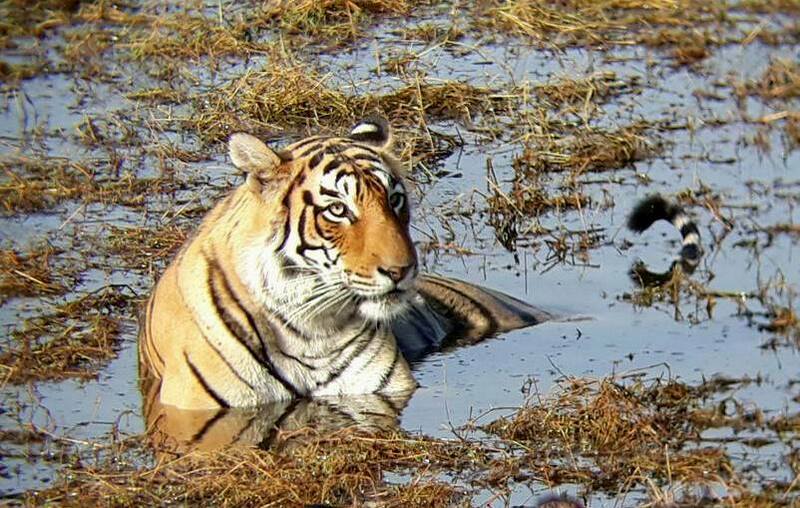 Today, Ranthambore Park has been listed among the best places in India to see royal Bengal tigers and other wildlife in Ranthambore National Park. During the tour to the famous Ranthambore National Park, there is an incredible and unique experience of the historical prosperity, nature and wild animals in the forest. Enjoy with nature while exploring the true beauty of nature, capture the best wildlife photographs and enjoy Jeep and Canter Safari. We offer reasonably priced for 1 night and 2 days Jaipur Ranthambore weekdays / weekend tour package to Ranthambore National Park, So that your boring weekend turns into a daring fun and the moment spent with wildlife dissolves with memories of your life. In the morning after yummy breakfast around 9.00 o'clock, you can start your trip to Ranthambore National Park. Our chauffeur will pick you from your desired location in Jaipur city. Ranthambore is around 180 km away from Jaipur by road. After a three and a half hour travel, you will reach “Land of the Tiger” Ranthambore National Park. On arrival at Ranthambore you will be transfer to hotel and check in at the hotel. Take the shower to remove the exhaustion of your long journey. After refreshing, take lunch at the hotel's own dining room. After lunch, Get ready to visit the historical Ranthambore Fort. Ranthambore fort is worth to visit in local sightseeing in Ranthambore. Ranthambore Fort is located within Ranthambore National Park. It was declared a UNESCO World Heritage Site under the group Hill Forts of Rajasthan in 2013. Ranthambore fort visit will be complete in around three hours. This tenth century fort with its battlements stretching out over the Aravalli Hills provides excellent views of the National Park and its lakes, visit the Ganesh Temple there, which is used by hundreds of worshippers daily. After returning from Ranthambore Fort, you can have tea & coffee in hotel restaurant. Have fun with the in house facilities of your hotel such as pool (maybe take a dip in the pool for a break from the heat of the day) or culture programs in the evening. Enjoy delicious dinner, overnight stay at your hotel. After wake up early in the morning, take tea & coffee with biscuits and get ready to go to safari in Ranthambore National Park. Ranthambore national park is one of the best wildlife tourist destinations in the world, to see Tiger and other wild animals in their natural habitat. Ranthambore National Park is home to a large diversity of wildlife. It boasts the tiger, leopard, the elusive caracal, hyena, sloth bear, wild boar, crocodile and many different species of birds. Ranthambore jungle safari tour is about 3 hrs. After the park visit, have a palatable breakfast in your hotel and check out. Our driver will take you back to your home/ hotel/ Jaipur airport with sweet memories and wildlife safari experience. - Round trip transfer from Jaipur to Ranthambore National Park by AC Car. - Toll Tax, Parking, driver Halt.